Cook your hot dogs and sausages according with desired cooking method. Hot dogs can be boiled, grilled, oven baked, or can be used right out of the package, uncooked. Sausages can be grilled, oven baked, or cooked in a skillet until done. For mushrooms, in a medium skillet, sauté whole mushrooms in butter until softened. For onions and peppers (as a side dish for sausages), sauté onion and pepper in 2 tablespoons of olive oil. Set aside. Roll out refrigerated dough and cut into three sections. 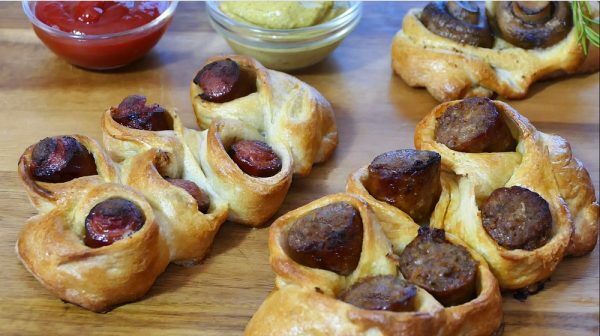 Place a line of hot dogs, sausages, or mushrooms in the middle of the dough. Fold the dough in half and pinch the edges to seal. On the side where the dough is folded, make 1-inch slits, leaving ⅓ from the sealed edges uncut. Twist the first cut portion to the left, and second to the right. Repeat this for the rest of the portions. Place the shaped dough onto a baking sheet (lined with parchment or greased) and brush the dough parts with egg wash. Bake at 350°F for about 20 minutes, or until golden brown. For the cheese topping, remove the Caterpillar Bread from the oven about 5 minutes before it is done. Sprinkle with cheese. Return it to the oven and bake until the cheese is melted (about 5 minutes). Pull the bread apart and dip it in condiments or serve with onions and peppers. Enjoy!